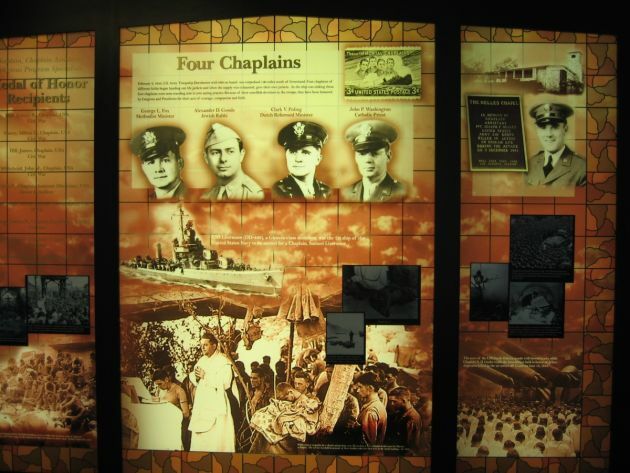 (U.S. Department of Defense)A display honoring the service of religious chaplains was dedicated at the Pentagon in 2006. The U.S. military is under fire in recent days for its regulations and policies related to religious proselytizing. The U.S. military says that its members may share their faith with other personnel as long as they do not force their beliefs on them. This new statement clarified an earlier one reported by Ecumenical News which created an uproar among evangelical leaders. In the first statement, released earlier this week, the national military headquarters at the Pentagon said that proselytizing in the armed services was banned. It also appeared to say that military personnel would be court martialed if they violated regulations related to proselytizing. The ban came on the heels of a meeting with activist Michael "Mikey" Weinstein, the head of an organization seeking to end all proselytizing in the ranks. The agenda concerned policies regarding religious tolerance in the military. Evangelical leaders, especially those associated with the Family Research Council (FRC), pounced on the Pentagon statement and the meeting with Weinstein. They especially directed their fire at Weinstein and inflammatory statements he has made about conservative Christians in the Huffington Post and elsewhere. Weinstein called fundamentalist Christians "monsters" and told Fox News that the military should prosecute personnel that share their faith. The FRC circulated a petition asking the Pentagon to disavow Weinstein's demands. By Thursday it had garnered 110,000 signatures. Conservative media also began to circulate reports on the matter. U.S. Today published the new announcement by Lt. Cmdr. Nate Christenen, a Pentagon spokesman, in its Thursday edition. "Service members may share their faith (evangelize), but must not force unwanted, intrusive attempts to convert others of any faith or no faith to one's beliefs (proselytization)," he said. Christensen's also said that military leaders take action "when religious harrassment complaints are reported." His statement is a further attempt to define in the media this week what the military means by the term "proselytizing" and the punishment for violating military regulations. The Nashville Tennessean reported on Wednesday that Capt. Jodie Ritchie of the the Air Force's public affairs defined proselytizing from its usage by the Merriam-Webster Dictionary, which says it is "to induce someone to convert to one's faith." "When on duty or in an official capacity, air force members are free to express their personal religious beliefs as long as it does not make others uncomfortable," he said." Proselytizing, a defined above, goes over the line." The current controversy is the latest dust up between Evangelicals and the Pentagon. Evangelicals complained recently when a training seminar the military held for reservists taught that they awere extremists. The training, once publicized, also created a stir among some policially conservative members of the the U.S. Congress.